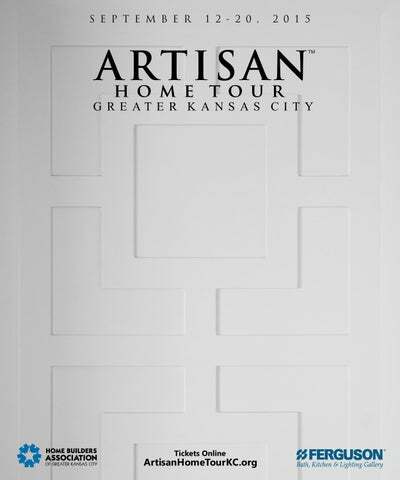 The Artisan Home Tour Greater Kansas City is a ticketed charitable event designed to benefit the work of the Ronald McDonald House Charities-Kansas City. The more tickets that are purchased, the more our community can help these special families whose children are being cared for at Children's Mercy Hospital. Choose from three options to purchase your ticket to tour. Two of the options give you access to tour all ten homes once and re-visit two homes of your choice; the third option is a single home only tour. Homes are open September 12-20, Noon â&#x20AC;&#x201C; 7pm daily. This ticket provides one entrance into all 10 homes and a re-visit to 2 homes. Purchase upon arrival at your first home. Purchase online or upon arrival at the home. See the listing of all ten homes. Select a home to view more details including photographs, home descriptions, location and builder information. Use the mapping feature for convenient driving directions. Rate homes in variety of categories and add your comments. Letâ&#x20AC;&#x2122;s make this easy. Scan for the app. Scan this code to go to ArtisanHomeTourKC.org and take advantage of the custom mobile app to view the homes and map your tour. Welcome â&#x20AC;&#x153;Come see what Artisan means in the impeccable qualities of these one of a kind homes.â&#x20AC;? n Kansas City we build homes with craftsmanship and the finest materials, the kind of detail and character that you don't find just anywhere. We are thrilled to feature ten of these homes and their custom builders, September 12-20. We also are proud that this event will benefit Ronald McDonald House Charities-Kansas City. Custom home builders know the answer does not lie with a minimum price, square footage, or architectural style. Rather it lies in the elevated standards of design, superior craftsmanship, and exquisite products. Kansas City's finest custom home builders know when they are creating a structure that is transcendent for the builder and for the client. When that mark is met, the home is an Artisan Home. For the Artisan Home Tour of Greater Kansas City, an architect review process helped ensure the homes met the quality levels. Every builders' architecture plans were judged individually on their merits by one of Kansas City's most acclaimed architects, Scott Bickford, R.S. Bickford and Company. Bickford took into consideration the goals for these unique custom home entries while holding the plans to the highest quality standards in nearly twenty categories ranging from exteriors, millwork, windows, and doors to roofing, flooring, furnishings, and landscaping. More about the Architect As the principal designer for R.S. Bickford and Company, Scott Bickford, stresses the client's preferences more than his own artistic expression. He works within context as much as possible, designing with respect for the project's surroundings, be they a rural setting, a historic neighborhood or a brand-new suburb. He regards the house not just as an abstract exercise of the designer's artistic virtuosity and technical skill, but also – indeed, primarily – as an adjunct to the client's lifestyle and as an expression of the client's character, values and vision. Frequently Asked Questions Who produces the Artisan Home Tour? Can I visit a favorite home a second time? The Home Builders Association of Greater Kansas City is proud to present the Artisan Home Tour. The HBA also produces the Parade of Homes, a 67 year Kansas City tradition. Yes, you can visit two homes twice. September 12-20, 12pm-7pm every day. Anyone above the age of five will need to purchase a ticket. An adult must accompany and be responsible for children at all times in the homes. How much does it cost to attend the Artisan Home Tour? Is there a mobile app I can download to my smartphone? To tour all ten homes, tickets are $30 when purchased at the homes and $25 online. A single home tour is $10 at the door or online. Yes. From a mobile phone, go to the Artisan Home Tour KC website, ArtisanHomeTourKC.org and click on the link to the app. Follow directions to download it and enjoy the features including buying tickets, view homes and amenities, and see maps to the locations. What are the dates and hours of the Tour? A portion of ticket sales goes to Ronald McDonald House Charities-Kansas City to help these special families whose children are being cared for at Children's Mercy Hospital. Pets, food and beverages, baby strollers. Can I take photos? Photography is not allowed in the homes. How do I get my ticket when I buy online? You will receive an email with your ticket. Print it off or save it to your mobile device. Begin your tour at any home and the ticket processor will activate your ticket. You'll be able to tour each home once during any day of the event, September 12-20, and you may re-visit two homes of your choice. What if it rains? The tour runs rain or shine and tickets are non-refundable. Where do I park? Parking spaces are located at or near the homes. Do you accept credit cards? We accept Visa, MasterCard, and American Express both online and upon entry to the homes. No bills over $20 will be accepted at the homes. What if I only want to visit one home? Yes. You will be asked to wear bootie shoe coverings before entering the home in order to keep floors from being damaged. Bathrooms are not available at the homes. Will I need to wear booties over my shoes? If you have a favorite builder or want to visit a home near you, single home tickets can be purchased at each home for just $10. The elevated standards of the Artisan homes are reflected in this premier event presented by the Home Builders Association. To achieve such quality, some of the industry's finest suppliers of home products and services have provided their support as sponsors. These sponsorships exemplify a unique commitment to excellence in custom home building and we thank them. Artisan Home Tour Committee Provides Leadership A dedicated group of Home Builders Association builder members volunteered year round to provide their leadership to create this first time event. They kept in mind the priorities including demonstrating to home buyers the quality of custom homes and the skills of the custom home builder. They also emphasized the importance of giving back to the community through meaningful charitable donations. Seated, left to right: Chris Ragland, Homes by Chris, Dobbe Dobberstine, Dobberstine Custom Homes, Sara Corless, HBA, Craig Eymann, Ambassador Construction Standing, left to right: Justin Pfeifer, Pfeifer Homes, Inc., Brent Dobberstine, Dobberstine Custom Homes, Patrick Willis, Willis Construction Inc., Scott Bickford, R.S. Bickford and Company, Bruce Rieke, BL Rieke Custom Homes. or the past forty years, Don Julian has set a new standard for design, quality and outstanding customer service in the home building industry. His unique architectural designs and innovative, award-winning floor plans have become a Julian trademark in metropolitan Kansas City. in the marketplace. His innovative nature reveals itself in such elements as virtual “walls of glass,” which he introduced even before the “light and bright” open floor plans that have become a Kansas City standard. In the late 1980’s, Don began to focus more on the development side of the business. As further evidence of Julian’s talent to meet the market demands of changing lifestyles, he is credited with the successful development of several upscale communities, such as the prestigious Northland subdivision Riss Lake, as well as Lakewood Oaks, Lakewood Shores, and Tiffany Greens. Don constructed his first home in Kansas City in 1974 after a promotion to director of engineering at an east coast Fortune 500 company required a move to Kansas City. During his search for a home in the metro area, Don quickly realized that a custom built home was what he wanted for his family. As Don’s interest in construction grew, he decided to make it a full-time business. As a tribute to his success, for two consecutive years, Professional Builder magazine listed Don Julian Builders as one of the top 400 builders in the United States. Home No. 1 6049 Southlake Drive, Parkville, Missouri â&#x20AC;&#x153;Fire, Water and Iceâ&#x20AC;? is the theme for this unique home that nestles into thick woods with the serenity of a lake view. A bubbling water feature flowing underneath the front walk bridge with a dry river bed surrounded by lush and vibrant landscaping, welcomes you to this peaceful oasis. Inside, exquisite finishes designed with an edgy, transitional style, produce a desire to view more of this architecturally pleasing home. Enjoy observing one-of-a-kind tile and glass features, specialty lighting, luxuriously customized cabinetry, as well as distinctive beams all accentuating the beauty of this home. The lower level bar, perfect for entertaining, showcases an illuminated waterfall accompanied with suspended glass tops, hanging lighted display shelves and two sinks. The restful sound of water draws you to the outdoor living area, revealing a floating fire pit encased in hand-made stone pillars with cascading water falling from the stone into a reflecting pool. Everywhere you look invites you to enjoy a soothing and relaxing place to call home. asa Bella Construction has earned a reputation as one of the Kansas City metro area’s premier custom home builders. They are consistent winners of the Home Builders Association’s American Dream Grand Award, Pick of the Parade, and Distinctive Design and Plan contests. The company has also won numerous awards from local publications. latest design trends, both nationally and internationally.” Casa Bella takes pride in the broad range of architectural styles they have had the opportunity to design and build over the years. Groshans says, “As long as it is thoughtfully designed and flawlessly executed, all of the architectural designs can be special and have mass appeal.” As a Certified Graduate Builder and Certified Green Professional, Groshans is well versed on “Best Build Practices,” which he consistently incorporates in all of his homes. He also is proud of his team that is composed of some of the area’s most highly skilled professionals and tradesmen. These team members often refer to Groshans as a perfectionist with an incredible eye for detail with the goal to exceed the client’s expectations. Home No. 2 6069 Southlake Drive, Parkville, Missouri This spectacular home is filled with many wonderful surprises, such as a two-story, indoor waterfall. It has every custom upgrade and feature a discerning homeowner could want or imagine. The open and flowing design, with soaring ceilings, and the amazing outdoor hardscapes and serene lake view, are simply breathtaking. Every feature in this home was carefully selected by an award-winning design team and builder. The nearly limitless upgrades include integrated smart-home technologies that interface with both smart phones and tablets. The home is outfitted with top-of-the-line professional appliances and beautifully designed custom cabinets throughout. You will simply be amazed at the designer series tile, granite, hardware, plumbing fixtures and lighting used throughout the home. After enjoying these indoor features, walk out to the amazing terraced back yard and experience the professionally designed hardscapes, including: pergola, sitting wall, fire pit, and waterfall. It is truly a private haven situated on a deeply wooded lot with beautiful lake views. Directions: I-29 North to 64th Street, west on 64th to Riss Lake Dr. then south on Riss Lake Dr. to Clearwater. West on Clearwater to Southlake. South on Southlake to home. “We are in our homes every day, overseeing the project, making sure things are done right for the client." or more than ten years, Homes by Chris has been an award-winning designer/builder in the Kansas City area. This is a company owned and operated by Chris and Roy Ragland, a husband and wife team who have built more than 200 homes in the Northland area. This fantastic partnership started years ago at the University of MissouriColumbia. Chris graduated from UMC in economics, earned an MBA from Rockhurst University, and spent 20 years in corporate project management before joining Roy in the building business. Roy first worked as, and still is, a Realtor, before deciding to form the building company in 2003.
design. Clients will work directly with Chris and Roy, a very unique opportunity in the building industry. “We are in our homes every day, overseeing the project, making sure things are done right for the client. We are involved in every step,” notes Chris. “We are a team, offering both the male and female perspective.” Although each of their homes is custom and unique, their signature style is streamlined and fresh, with hints of craftsman details, featuring extensive woodwork and natural stone, marrying the exterior and interior with outdoor living areas. Chris ensures that she writes each family’s story into the walls of their home. Of all the things that can be added to a home, personality is naturally one which comes with a well-built home matching a family’s lifestyle. Home No. 3 10431 NE 106th Terrace, Kansas City, Missouri This extraordinary luxury home is the perfect blend of breathtaking beauty and sophisticated style. With a unique entrance and excellent use of both space and design, this home is an example of what a high-end home should be. The main level dazzles with spectacular built-in cabinetry throughout the entryway, kitchen, and dining area. The spacious bedrooms, master bathroom suite, and expansive closet are nothing but enviable! In the lower level of the home, you will find a wine cellar, a full bar with a secret entrance to the suspended garage, and an area for a pool table and separate game room. The lower level walks out to an estate-sized lot in a serenely elegant community, making it the perfect home for you. “We want the process of designing and building a new custom home to be as enjoyable as possible." uilders and designers of custom homes in the Kansas City metro area for over ten years, brothers Kit and Gerry Starr of Starr Homes have developed a reputation for superior planning, quality construction/materials, and saving their clients' money through energy-efficient building techniques. quality, timeliness, and satisfaction all the way through the closing and warranty. Kit and Jerry pride themselves on helping clients achieve all of the functionality, character, and beauty they are seeking in their home – ensuring the design has a great flow and feel to it. “In every home we design we listen very carefully to our client's needs and wants and it is our job to make sure that the flow, sizing, function, and lighting of every space is just right for them,” said Kit. “Designing a home that 'just feels right' every time you walk into a space requires merging function, art-form, and engineering into a practical plan. My strength is the ability to bring that vision together; pulling from my design and engineering background into a cohesive set of plans,” said Gerry. Home No. 4 4741 NW Canyon Road, Lee’s Summit, Missouri This striking home combines transitional design with a coastal sense of style that you’ll love. The exterior blends shakes and traditional lap siding with the solidity of stone below and embraces the welcoming front porch. Sounds of the natural waterfall and spectacular views of the lake create an intimate setting among the lush tree surround of this home. Inside you’ll discover this is an ideal family-oriented home complete with discerning care in every detail. This amazing home is exceptionally true to the character of its coastal design featuring clean lines and spaces infused with light colors while incorporating some rustic elements. Designed for multi-generational use, in collaboration with a growing family, you will discover features that speak to today’s lifestyle while embodying the comfort and warmth only fine craftsmanship can achieve. Directions: From I-470 take exit Lakewood Blvd/Bowlin Rd. Turn West on NE Bowlin Rd. which turns into Lakewood Blvd. Turn right onto Canyon Drive. The house will be on the right side. Lower level features curved custom bar, walk-in wine cellar, storm shelter, 2 additional bedrooms (each with full private bath), billiards, media, and game rooms. “Our clients inspire us every day." growing families to downsizing empty nesters. They work with the top design professionals in the industry to offer flexibility and originality in styles. illis Custom Homes has made a name for itself in the luxury housing market. The company is widely recognized as a leader in the industry and creates trends that influence the way homes are built in the future. While the company has collected a number of prestigious awards for quality and design, many of their homes also incorporate Universal Design principles. Elevators, zero step entries, wider hallways and doors create a home that is “Fit for Life.” Willis is a CAPS (Certified Aging in Place) certified builder of which Universal Design is a key principle. Bob Willis started the company over 50 years ago. His son, Patrick, was born and raised in the industry. Patrick is quoted, “I had the good fortune of learning from the best!” The Willis team is small enough to pay special attention to each client and is committed to results that exceed expectations. Every home maintains a high quality, artisan feel. Willis Construction takes great satisfaction in converting a customer's wish list into reality. A testament to Willis' reputation is repeat and referral business. They have been asked to build for clients a second time and their homeowners gladly refer them to friends and relatives. Home No. 5 100 Dunhill Court, Village of Loch Lloyd, Missouri This incredible gem of an estate is nestled on a huge, wooded cul-de-sac lot in the resort-like community of Loch Lloyd, Missouri. Observe the breathtaking setting as you wind up the driveway on Loch Lloyd North’s largest estate lot. Inside, you will find the ultimate entertainment home adorned with unique features that you’ve only dreamed existed! This Artisan Home Tour entry offers the features today’s homebuyer is looking for – elegance in design, functionality, energy-efficiency and comfort. The grand entry, sophisticated living area and spacious sunroom provides a unique cosmopolitan feel that allows for entertaining in a relaxed, natural s e t t i n g .
“The satisfaction of exceeding our client’s expectations makes the extra time and effort put forth worthwhile." mbassador Construction has specialized in building creative, high quality homes throughout the Greater Kansas City area since 1972, accumulating numerous local and national awards along the way. same top quality subcontractors year after year, Ambassador is able to maintain the highest level of excellence in quality craftsmanship, materials and architectural style. Craig was previously the Managing Developer for Cedar Creek, a 5,000 acre master planned community. He is a past President of the Kansas City Home Builder's Association. Brothers Craig and Keith Eymann, who formed the company along with their father, have become well known for the construction of one-of-a-kind custom homes. They offer their clients personal assistance during every phase of building a new home, from lot selection, plan design, and material selection to completion of the home. They are committed to making the building process rewarding and enjoyable for the homeowner. Many buyers return to build a second home and even third home, proving the reputation of trust and confidence in the resale value of an Ambassador Home. “I enjoy the challenge of building a diverse range of architectural styles, having built homes that range from modern contemporary to elegant old world designs,” explains Keith, who attended Kansas State University where he studied construction management and landscape architecture. “It is important that proper techniques are blended with authentic materials to insure the integrity of each Ambassador Home,” he adds. Home No. 6 3848 W. 105th Terrace, Leawood, Kansas It's all about location, location, location. And this house has it, plus much more. Located in the heart of Leawood, Kansas in Mission Farms, you'll love the urban feel with walking access to unique retail shops, a fitness center, and some of the city's best restaurants. The traditional exterior of the house is made of natural architectural features such as Kansas native limestone, lime finish stucco, concrete roof tiles and custom 6' x 8' African mahogany front doors that are the focal point of the house. Step inside and you'll love the open floor plan featuring four 8' x 10'-foot sliding glass doors creating light-filled and airy rooms. The main floor features 7” wide solid white oak floors; African Mahogany cabinets, doors and trim; hand hammered copper sinks; brushed stone countertops; and top of the line GE Monogram appliances. This is a home with discerning attention to detail in every phase and has something uniquely different to offer. Directions: Mission Road to W. 105th Street, 1/2 block turn right on 105th Terrace. “Building not just a home, but a dream-come-true." uality craftsmanship, functional creativity, and personal satisfaction are what you feel as you step into a Lambie Custom Home. Respected as one of the top builders in the Kansas City area, Lambie Custom Homes, Inc. has carved out a niche for itself in the highly competitive upper bracket homes market. A respected member of the Board of Directors for the Home Builders Association, he has won numerous awards locally and nationally. Lambie Custom Homes, Inc. is not just a business for him. It is a calling, one dedicated to bringing each and every client the lifestyle they envision for themselves as they begin the process of building not just a home, but a dreamcome-true. “This is what I do and I love it,” he smiled. Home No. 7 14703 Rosewood Street, Leawood, Kansas With your first step into this truly exquisite family home you will see that every attention to detail has been met. Upon entering the 10 foot double Mahogany doors you will be amazed at the view of the floor to ceiling windows that look all the way through the home out to the covered outdoor entertainment space that is nestled in the highly sought after Highlands Creek subdivision. The home’s floor plan offers the versatility of being able to entertain both inside and out with a seamless transition. The eclectic color palette boasts the trending greys and whites but still includes traditional blacks and creams. The kitchen is a cook’s paradise with every imaginable appliance and a custom stainless vent hood accented with brass straps and rivets to complement the home’s design. Clean lines, natural and textural materials are the highlight of the design along with a serene water feature on the lanai that reminds you that this Lambie Custom Home is built to celebrate living and to provide a quality home for a lifetime. 69 Hwy to 135th then east on 135th to Nall. South on Nall to 147th then east to the home located on the corner of 147th and Rosewood. “Excellence and integrity in a unique team environment." ounded in 1988 by Jeff S. Robinson, who still owns and operates the business, J. S. Robinson Fine Homes is a customer-oriented company that has built more than 1300 homes in many of the finest communities throughout the greater Kansas City area. nities where he builds. He carefully chooses each to ensure that it offers the best possible amenities, a convenient location and excellent schools. A perennial winner for top awards from the HBA during the Spring and Fall Parades of Homes each year, he builds throughout the Kansas City area, including several new-home communities in Overland Park, Olathe, Lenexa and Shawnee. What is the J. S. Robinson difference? They are passionate about building beautiful homes and helping people, with an unwavering commitment to their loyal customers. The majority of the J.S. Robinson Fine Homes team and trade partners have been with the company for many years, some for 20 years, through all of the economic variables of the housing industry. Simply put, “We have hand selected an amazing team of employees, vendors, and craftsmen, we respect and empower them, and we get superior results,” said Jeff. Home No. 8 16101 Century Street, Overland Park, Kansas This stunning reverse story and a half home features transitional design with modern accents that invites both casual family life and entertaining. The exterior of the home combines a low pitch tile roof with cool stone for a unique appearance in South Overland Park. Inside, the main floor is open with vaulted ceilings connecting the kitchen and great room that flows to an indoor/outdoor entertaining space backing to a lush and beautifully landscaped yard. The lower level features a walk in wine cellar surrounded by stone arches with an adjoining tasting area and bar. The attention to detail in this home is second to none, and Jeff and his team are more than excited to present this wonderful home. “Built on tradition, growing through innovation." ovenant Custom Homes is a premier “boutique” builder specializing in the conceptualization, design and construction of high-end luxury residences. For more than two decades John Menghini, Sr. and son Michael have crafted some of Kansas City’s most unique homes. Because Covenant Custom Homes limits the number of its projects each year it is well positioned to provide the significant time and laser focus that each project demands. Covenant Custom Homes has built a reputation on layering level upon level of architectural and design details in every custom home they build. Constructing beautiful homes with outstanding functionality is their passion. Home No. 9 16105 Century Street, Overland Park, Kansas Introducing the Treviso – a true masterpiece of function and style by Covenant Custom Homes. This exciting new story and half plan is filled with exquisite detail in every room. From its soaring two-story great room with “linear stone” fireplace, to its incredible cook’s kitchen with built-in refrigerator and six-burner range, this transitional style home is a gem to behold. The main-floor master suite comes complete with sitting nook, stylish bath, master laundry center and oversized dressing room/closet. Just off the beautiful two-story entry is a fabulous custom paneled dining room and beautiful stair hall with a stone feature wall. The exterior of this amazing new home features a stylish stone and shingle elevation, four car garage, relaxing yet functional lanai and a wonderful setting complete with lush landscaping on all four sides. “We build each home as if it were for our own family." odrock Homes, which was launched in 2002 by thirdgeneration builder Brian Rodrock and his brothersin-law, Jeff Gifford and Jeff Reglin, is founded on a philosophy of putting people first and creating homes of lasting value. Building custom homes throughout the Johnson County area, Rodrock is passionate about listening to each homeowner's unique vision with the exclusive Rodrock Custom Design Experience program. Comprehensive buyer services are offered from start to finish, including every detail from choosing a floor plan and high-quality, trendsetting interior selections to closing. Home No. 10 12711 W. 160th Terrace, Overland Park, Kansas The Telluride is a striking, modern mountain-inspired home that defines rustic elegance. Designed by architect Fred Kohlmeyer, the home incorporates extensive and innovative use of natural, hand-selected materials including reclaimed wood, native stone, wavy lap cedar siding, metal and iron. Acclaimed interior designer Kristen Ridler was handpicked by Rodrock Homes to capture the vision of gracious living. Punctuated by clean, straight lines, the breathtaking interior boasts a spectacular linear fireplace, floating staircase and a unique modern glass-and-iron front door, adding to the distinctive ambience of the 5,347-square-foot residence. Built as an heirloom estate home, the Telluride is a stunning showcase of craftsmanship that exudes the essence of artisan—from the glowing oak floors throughout to the drama of a two-story light fixture dropping from the second floor. Expansive windows allow natural light to flood the rooms, creating a refreshing, soothing interior with a view to the cozy firepit in the lushly l a n d s c a p e d b a c k y a r d .
HBA and Ronald McDonald House Charities-KC A Longtime Charitable Partnership The Home Builders Association of Greater Kansas City is pleased that the Artisan Home Tour is in partnership with the Ronald McDonald House Charities-KC. Proceeds from the ticket sales will benefit this remarkable Kansas City nonprofit organization that provides a "home away from home" while the children are receiving medical care in Kansas City-area hospitals. Sara Corless, HBA, Jeff Alpert, the Alpert Companies, Holly Buckendahl, Ronald McDonald Charities, Richard Mather, Richard Mather Builders, Dobbe Dobberstine, Dobberstine Custom Homes, Patrick Willis, Willis Construction, Hatch McCray, McCray Lumber and Millwork, Patt Papenfuhs, Ronald McDonald House Charities. This isn't the first time these two nonprofits have banded together. The organizations have enjoyed a 34 year partnership. The HBA was there in the beginning when members helped remodel the very first Ronald McDonald House on State Line Road near the University of Kansas Medical Center in 1981. In 1988, the HBA helped RMHC build and open the second home on the corner of 25th and Cherry Street. The Home Builders Foundation Fund of Greater Kansas City was formed in 2002 as the charitable arm of the Home Builders Association of Greater Kansas City. It is supported through contributions from HBA members and other partners from the metropolitan area. The mission is dedicated to advancing a range of charitable, educational and community causes that help address issues of housing affordability, job training, declining neighborhoods and related matters. And most recently, the Home Builders Foundation Fund made a contribution to the capital campaign for the Wylie House that opened February 2015. A group gathered for a check presentation where Advisory Board Chairman Jeff Alpert, The Alpert Companies, made these remarks. The Fund is maintained and invested through the Greater Kansas City Community Foundation that provides a range of services for many of the largest and most respected philanthropies and foundations in the community. Thanks to the generosity and commitment of HBA members, affiliates and friends the Fund continues to thrive. Their ongoing support and commitment is crucial to providing funding for anticipated programs, projects and causes. Offering generations of home buyers the largest and most impressive display of new homes in the Greater Kansas City Metropolitan area.